The new Solo770 Battery Baton is a higher capacity version (3000mAh) of the Solo760 (2200mAh). It allows greater efficiency on site as it gives more tests per battery, for the same charge time as before but provided by the new Solo727 charger. This Solo727 charger provides the same functionality as before – enabling fast charging of Battery Batons from both mains power and in-vehicle outlets. 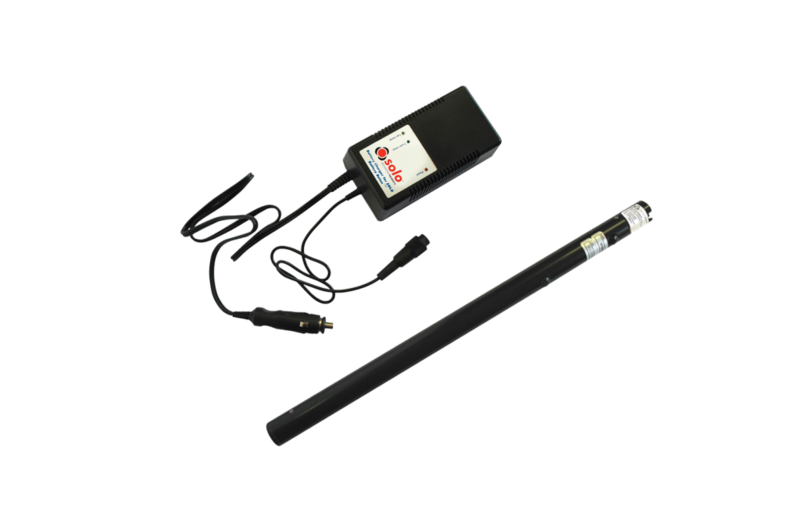 All existing 2-baton kits that include the above products will be updated to include the higher-capacity batteries and chargers. The older Solo760 batons and Solo726 charger will continue to work with Solo, Testifire, and Scorpion products, and do not need to be replaced unless they have reached the end of their useful life. Each charger and battery combination is designed and certified to give a 60-90 minutes charge time i.e. Solo726 charges Solo760 batons, and Solo727 charges Solo770 batons. To help match the battery to the charger, a red sleeve has been added to the Solo727 Charger (on the battery lead) which corresponds to a red collar on the top of the Solo727 battery baton. The Solo726 charger and Solo760 battery baton continue to be all black.